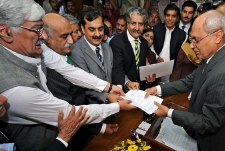 With the PPP leadership having endorsed him and his nomination papers having been accepted, unless something dramatic happens – and in Pakistan, it always can – Syed Yousuf Raza Gillani will soon be elected as the next Prime Minister of Pakistan. Whether Mr. Gillani will become the person to harken meaningful democratic change in the country or yet another in a string of powerless Presidents and Prime Ministers who held ceremonial office while others wielded real power remains to be seen. But right now, today is his day. We wish him well and wish that he will make it memorable and prove our inherent cynicism wrong. For someone who has been in politics as long as he has it is rather amazing that so many know so little about him. The question that one keeps being asked is not “how he will do?” but “who is he?” (You may not have recognized him 2 days ago, but after the dose of portraits above, this should be a face you won’t soon forget!). Of course, the second question impacts the first. So, here is a complilation of interesting facts about Syed Yusuf eza Gillani’s profile. 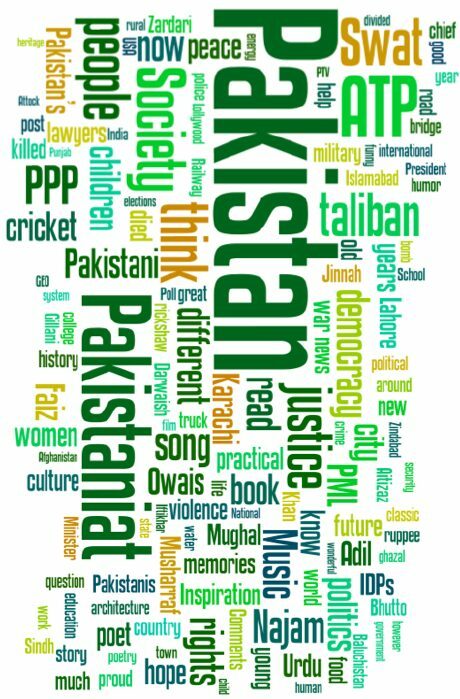 These have been compiled from a variety of sources, including the BBC, Dawn, and Daily Times. Syed Yousuf Raza Gillani was born on 9 June 1952 in Karachi but his family hails from the Punjab. The Gillanis are among the most prominent of landowners and spiritual leaders in the south of the province. Their home town is the ancient Punjabi city of Multan. Syed Yusuf Raza Gilani is a member of an influential political family of Multan, started his political career in 1978 after the death of father Makhdoom Alamdar Hussain Gilani, who was a signatory to the Pakistan Resolution. Mr Gilaniâ€™s grandfather, Makhdoom Ghulam Mustafa Shah Gilani, and paternal uncle Makhdoom Raza Shah Gilani had been elected members of the legislative assembly after defeating the Unionists in the 1946 elections. Mr Gilaniâ€™s great grandfather, Makhdoom Raja Bakhsh Gilani, was both mayor of Multan in 1921 and member of the Central Legislative Assembly of India. He served as a member of the assembly from 1921 till his death in 1936 and was known as the father of the Indian Assembly. His larger family has always played a key role in Pakistan politics. His great grandfather Syed Sadruddin Shahâ€™s brother Syed Rajan Bux Shah was the first Gillani to be elected to Indian Legislative Council in 1921. He remained its member till his death in 1936. Gillanis joined the All India Muslim League in 1940s. Rajanâ€™s nephew Syed Mohammad Raza Shah defeated Unionist party candidate and PPPâ€™s another contender for premiership Shah Mahmood Qureshiâ€™s grandfather Makhdum Murid Hussain Qureshi in 1946 elections. Raza Shah was the only non-official president of the Multan District Board before Partition, defeating British Depty Commissioner EP Moon in the elections. He was brother of Yousaf Razaâ€™s grandfather Syed Ghulam Mustafa Shah. Razaâ€™s son Hamid Raza Gillani won National Assembly seats in 1962, 1965, 1977 and 1985. He served as parliamentary secretary in 1960s and as a federal miniuster in Zulfikar Ali Bhuttoâ€™s 1977 cabinet. He was elected to Senate of Pakistan in 1991. Mustafa Shahâ€™s son and Yousafâ€™s father Makhdum Alamdar Gillani was elected to Punjab Assembly in 1951 alongwith his brother Syed Walayat Hussain Shah. Alamdar Gillani was elevated to provincial health minister in 1953. He joined newly born Republican Party in 1956 and was disqualified by Ayub government from electoral politics. His brother and Yousafâ€™s uncle Rehmat Shah filled the vaccum by joining Ayubâ€™s Conventional Muslim League and winning a provincial seat along with Hamid Raza who kept on leading the family on the electoral scene till the time Yousaf ousted him in 1990. Another cousin of Yousaf Raza Gillani, Syed Tanvirul Hasan Gillani, also won a national seat in 1990 but from the platform of Islami Jamhuri Ittehad (IJI). 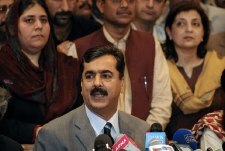 Syed Yousuf Raza Gillani holds an MA in journalism at the University of the Punjab. He also studied at the Forman Christain (FC) College in Lahore and at La Salle High School at Multan. Syed Yousuf Raza Gillani is a tall, softly-spoken man with an air of authority, supporters say he is known for doing the right thing. Mr Gilani was the first elected chairman of the District Council, Multan. He defeated the local government minister Syed Fakhar Imam, some 25 years ago. In 1988 elections, he defeated the then Punjab chief minister Nawaz Sharif on PPP ticket. In 1990, again on a PPP ticket, he was elected an MNA after defeating Makhdoom Hamid Raza Gilani, a former federal minister. In 1993, he defeated Malik Sikander Hayat Bosan and later became Speaker of the National Assembly. 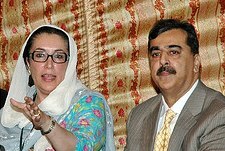 Mr Gilani contested the election in 1997 on a PPP ticket and lost the party did not win a single seat in Punjab. He could not contest elections in 2002. In 2008 he defeated PML-Q’s Sikander Hayat Bosan. Syed Yousuf Raza Gillani’s first term as a public servant was as a nominee of General Zia-ul-Haq. This means that he was not part of Zulfiqar Ali Bhutto’s original PPP team. Mr Gillani was elected as the chairman of the Multan union council in 1983. Two years later he was elected to the federal parliamentand made Minister of Housing and Railways. It was during this stint that circumstances arose which led to his leaving the League. While serving as a minister he fell out with then Prime Minister Mohammad Ali Junejo. This led to him being replaced as minister and sidelined in the party. Yousuf Raza Gillani served as the Speaker of Pakistan National Assembly between 1993-96. In 1995, Mr Gillani issued instructions for the release of parliamentarians detained by his own PPP government. When the interior ministry refused to oblige, he had the matter brought on record – a quite unprecedented action. Yousuf Raza Gillani refused to join the renegade PPP enticed by the Musharraf regime. Because he refused to do a deal with Gen. Musharraf his loyalty is much admired within his party. He was sent to jail by Gen. Musharraf in 2001, serving five years following a conviction over illegal government appointments.After being sentences by the Musharraf regime in 2001 he told reporters that the charges were “concocted and were fabricated to pressurise him to leave the PPP… Since I am unable to oblige them, they decided to convict me so that I could be disqualified and an example set for other political leaders who may learn to behave as good boys.” Reportedly, his stance and defiance won him many admirers, even among the government. He was finally released on 7 October 2006 from Adiala Jail, after spending more than five years in prison. Syed Yousuf Raza Gillani spent six years in jail and could not contest the 2002 elections. While in jail wrote a book Chah-e-Yusuf ki Sada (Reflections from Yusuf’s Well) while in jail. In the book he describes his decision to leave the Muslim League and join the PPP: “I was furious, and helpless at the same time, I knew I could not continue… and then I made up my mind.”Bhutto loyalist. Mr Gillani says he went to Karachi to meet Benazir Bhutto, Zulfiqar Bhutto’s daughter, then very much in the political wilderness. 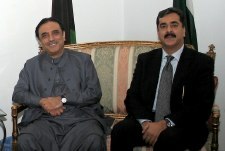 Mr Gillani says he presented his offer to immediately join the PPP. “Ms Bhutto said to me, ‘There is nothing I can offer you, why have you come? '” Mr Gillani said his reply was what sealed his relationship with the PPP and the Bhuttos. “I said to her, there are three types of people in this world. “Lovers of honour, of wisdom and of wealth. I am of the first type, and that is all I want.” Soon afterward, General Zia dismissed Mr Junejo’s government. Mr Gillani then joined the PPP, months before the general’s death bought an end to its political exile. Yousuf Raza Gilani has four sons and a daughter. He is also related to Pir Pagara, the head of PML-Functional. Syed Yousaf Raza Gillani is a descendent of Moosa Pak Shaheed, a great saint of Multan, Yousafâ€™s mother was a sister of Makhdum Hasan Mahmood of Jamaldinwali, Rahimyar Khan. Makhdum Hasanâ€™s other sister was married to Pir of Pagaro. Yousafâ€™s first maternal cousin Makhdum Ahmad Mahmood is provincial president of Pir Pagaraâ€™s Functional League. Ahmad Mahmoodâ€™s sister is married to General Musharrafâ€™s former loyalist Jehangir Tareen. Makhdoom Syed Abdul Qadir Gillani, Yousaf Raza Gillani’s eledest son, will marry the grand-daughter of Pir Pagara on March 24, 2008 in Karachi. The same day that he is likely to be elected Prime Minister of Pakistan. I hear he is a ladies Man and normally ladies donot make mistakes about the men they like from their heart. He must be a good man and i hope and wish Pakistan is entering a realy NEW ERA OF PEACE AND PROSPERITY. My point is not to complain that Gilani has no merits. It is only to highlight that we, as a nation, are enamored by lineage – and nobody is talking about his contributions. For the sake of democracy, if nothing else, it would be nice to know a bit more about his contributions that make him a good prime-minister to be the executive running day to day affairs of the country. Bilal, your comments seems a little unfair on Gillani. I think standing as Speaker for the rights of the rights of the MNAs against his own party leader IS an achievement on behalf of the nation. So is standing up to a dictator and refusing to bow like so many other did to the extent of spending 5 years in jail. That IS something on behalf of the nation. Unfortunately too many others did not have the same courage of their convictions. I am myself not fully sold on him because I fear he may become a rubber stamp for Zardari. But I am willing to give him a chance. Maybe sometimes we become a little too cynical! An impressive list of who he knows, who he is fathered by, and who his family is married into…Reminded me of biographies I used to read in my Pakistan Studies books about All India Muslim League leaders. ….but I am surprised you did not list any achievement on behalf of the nation by a political leader who has been in major positions for much of his adult life? I have been struck by the same even in biographies put together by national newspapers. Very impressive career. Good wishes to him. May he be able to stand to pressures in the future like he has in the past. Karzai-Gillani: What Are They Saying To Each Other? ATP Poll: Who is In-Charge in Pakistan? Muhammad Khan Junejo: How Should We Remember Him? Is Yousuf Raza Gillani On His Way Out?